Uses around 20 layers to do it. + 6 brush... Mixed a few diferent techniques and filters. Especial thank to Revan, for share this a beautiful art. I hope you enjoy this wallpaper and Im going to wait for your comments. Wow .... that is too cool. This is very nicely done. I think it will look good on my desktop for awhile. I just can't say enough about it. Gets a fav for sure!! 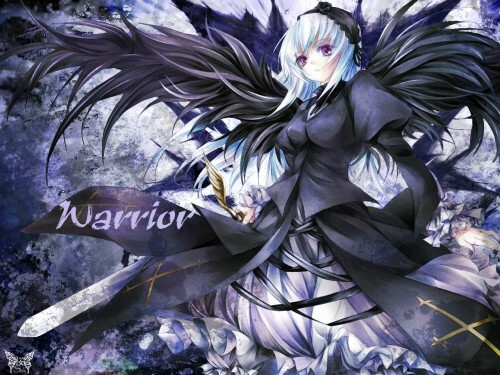 A really cool & pretty picture.She does kinda look like an angel of death...sorta.But it's a great pic. the girl looks well with this awsome bg !!! I totaly agree. Very nicely done! grunge work seems a bit plain but works amazing in here. very nice usage of colors too. nice scan... and u did it great with all the filters and brushes, just perfect! i was wondering if u can do something about chobits? Everythinhg juz fits well and blended perfectly together!! Thanks for sharing! me love as the scan!! she's soo cool!! i love her dress and the bg is cool as well! the colors fits the color of the scan though me dont like the font but overall nice wall! +fav! it totally took you over when i first saw it. a great wallpaper! I don't know the anime/manga, but it's still a great one! ^^ It will surely go to my fav's! Wow! Amazing! Dark and spooky ^^. Love this wall! Thanks for sharing!